Who is it for? 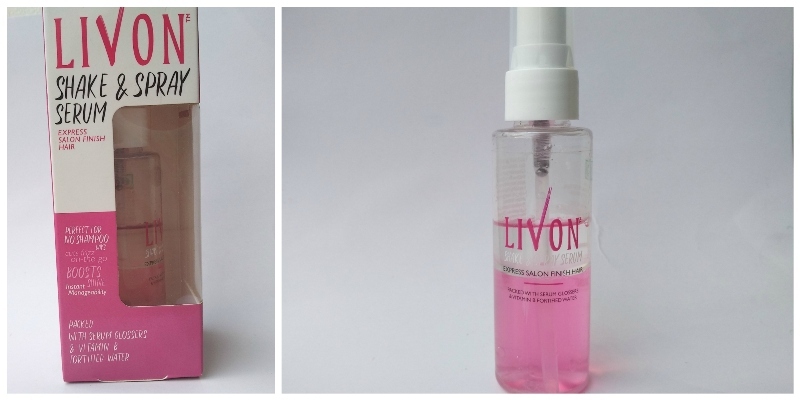 Livon Shake and Spray Serum for those days when you don’t get time to wash your hair and want a quick fix for your dry and unruly hair. Sensitive Skin Alert? No, but avoid contact with eyes. The serum comes in a clear plastic bottle with a spraying nozzle. The packaging is must say very travel-friendly as the bottle is made with sturdy plastic and also it is spill proof. It has pink and transparent bi-phase water-like consistency. It has a very pleasant fragrance which is not overpowering. I generally wash my hair twice a week and after one day my hair gets fizzy. This product really saves my bad hair day when my hair feels unruly and frizzy. I take 2 or 3 sprays directly on the ends of my hair and comb with my fingers and my hair is just good to go. What I dislike about this serum? Yes yes yes. It is an absolute savior for dry and unruly hair.